Wholesale Decals For Many Purposes! Cheap! *Promote that special event. Stick decals anywhere! *Promote your business. A decal for every customer. *Great for DJ's and other business that build customers from customers. *Get your name out. It builds trust so your customers won't hesitate to spend their money with you. *For a car club or team. Many styling options available! *Very affordable way to promote just about anything. *We do not sell graphics from the online catalog wholesale. Easy...just let me know what you need and I will give you a personalized price quote for your job. Prices range from a $1 per sticker/decal and up. 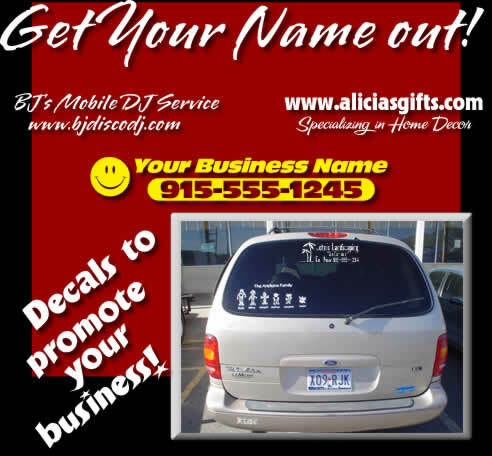 Decals are made quickly, usually in about a day depending on quantity ordered. Contact Full Intensity Grafx here.